Seven West Media are using the big stick of the law to bully, harass and intimidate former female staff members into silence about what really happens at Seven West Media and also defame them with allegations that are nothing but lies by Seven’s management. But the women, Amber Harrison, Amy Taeuber and Talitha Cummins are standing their ground and taking the fight to Seven West Media and their grubby directors, management and lawyers. What is obvious is when you investigate what is happening at Seven West Media is that the sexual harassment and abuse is at epidemic proportions and the main perpetrators are senior management at the highest level. It is being conducted by management, facilitated with shareholder’s money and covered up at board level. Amber Harrison isn’t the only woman taking on Seven West Media legally at the moment and being given the legal run around by Seven West Media. So, let’s look at two other women first and then we will look at the explosive unchallenged evidence that Amber Harrison has published in the last few days which puts Kerry Stokes right at the centre of the scandal and further evidence of Tim Worner’s drug use and another sexual harassment complaint against Mr Worner swept under the carpet. After making a complaint of sexual harassment, against Channel 7 journalist Rodney Lohse in March 2016, Amy Taeuber who worked full-time as a journalist for Seven in Adelaide was sacked for “breaching internet policy” only a few weeks after her sexual harassment complaint was swept under the carpet. Amy’s sister Sophie who also worked at Seven as a freelance journalist was also forced out in a stock standard constructive dismissal as the work quickly dried up after the sexual harassment complaint was made. Newsreader Talitha Cummins was on maternity leave when she was told she would not be returning to Weekend Sunrise. Channel 7 orchestrated another obvious case of constructive dismissal against Talitha Cummins. It was reported in January this year that Seven changed her role and the time of work that made it impossible for a new mother to be able to manage which forced her out of a job at Seven. WEEKEND Sunrise newsreader Talitha Cummins is taking on Channel 7 for unfair dismissal, claiming she was sacked from the role while on maternity leave. Ms Cummins claims that soon after her first child, Oliver was born, the network told her she would not be returning to the role she had held for three years after her contract expired. It came as the 36-year-old was in the midst of promoting a hugely popular episode of ABC-TV’s Australian Story, which revealed her battle with alcoholism and detailed her four year sobriety. The Daily Telegraph reports Seven News chief Craig McPherson phoned Ms Cummins nine weeks after the birth of her son to tell her she was no longer under contract. I wonder who at Seven decided to run the constructive dismissal strategy to get rid of Talitha Cummins? Seven West Media are doing their best to blame Amber Harrison for everything but as the evidence shows below Seven’s CEO Tim Worner has had other complaints made against him and News Corp have reported that there are at least seven women Tim Worner is alleged to have had affairs with and used company funds to facilitate. 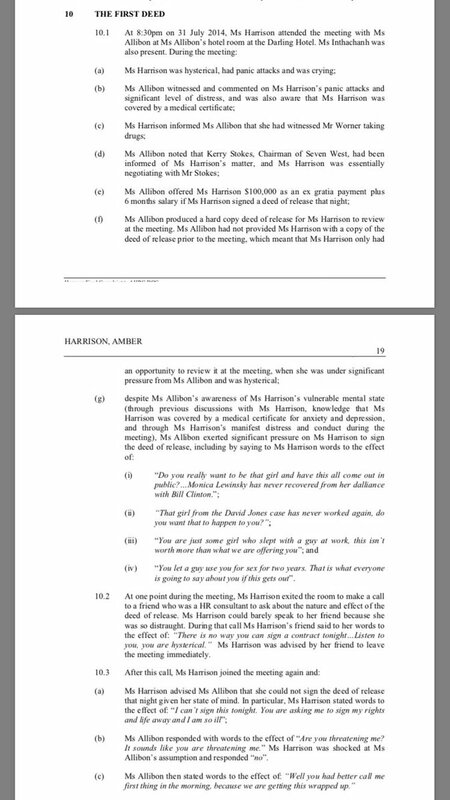 Amber Harrison has published evidence on her Twitter account in the last few days that shows Seven’s Chairman Kerry Stokes used shareholder’s funds and personally negotiated a $100,000 bribe in 2014. If that is the case then Stokes would have also had oversight of the ultimate blackmail of Amber Harrison. It must be remembered that Kerry Stokes and Ryan Stokes are themselves known for having multiple sexual relationship with women at Channel 7. They must think Tim Worner’s conduct is part and parcel of doing the CEO’s job or maybe it is part of the fringe benefits that Kerry and Ryan think it is OK for Tim Worner to indulge in. Jeff Kennett, Kerry Stokes and Tim Worner. Stokes and Worner are the ones with the most to lose and the ones attacking Amber Harrison the hardest with the War of Law. Seven West Media management and the Directors, including former Victorian Premier Jeff Kennett, are lining up to attack Amber Harrison and trying to blame her for everything. But how do they explain the clear pattern of Seven abusing women and their legal rights such as with the Taeuber sisters and Talitha Cummins and then going on a War of Law, as Amber Harrison describes it, trying to deny them their rights even further and corruptly dragging out legal proceedings. A lot of people who follow this website have been denied justice but something as simple as setting up a Twitter account such as Amber Harrison can help you fight back or you could go one step further and set up a website or Facebook page. The War of Law is used by other companies as well but Seven West Media seem to have refined it to a new art form. Almost everyday new evidence is being published showing what the Seven West Media Board of Directors have been concealing from shareholders and failing to take action on as the Seven West Board already have copies of the evidence. Something will have to give somewhere in the not too distant future otherwise it will be a very painful and costly battle for Seven’s shareholders. I have no doubt the whole proceedings is being paid for by Seven West Media on Kerry Stokes’ instructions and is part of the War of Law strategy to close the whole story down. This is on top of the contempt proceedings being run by the court which I wrote about a few days ago. (Click here to read the article). For me it is a free speech issue and I will be standing my ground and fighting. I note the evidence is stacking higher by the day against the persons representing the publicly listed 7 West Media entity, including their chairman of directors, the persons appointed as directors to the executive board of 7 West Media, also including the CEO and key management level persons. The out of court settlement amount prospects first considered, may soon balloon out into a mountain of compensatory settlement monies, although this will be subject to the tolerances shown toward the acts of disgust (albeit they are on the rise) may have the 7 West media shareholders group together for discussion about the infidelity of those chosen to manage their 7 West media investments entrusted to the above referenced persons and could abandon or discard this entire band of sexual predators.. I wish that to be the case. That ‘it’s integrity closely examined by those eminent persons that have an impeccable knowledge of Australian law…..’ – unfortunately when one of those executives, specifically, holds close connections with the said people, there is no close examination. In fact, it is the opposite. No court is unbiased while those connections exist and mates sit on the bench. “The war of law” In war there are no rules, only winners and losers, the winners are the ones with greater power and access to resources. No body is accountable for the damage wreaked upon the innocent or the wasted life and resources. In Australian law the lawyers are not accountable for their actions, and engage in misleading and deceptive conduct without fear of retribution by the regulator. In war the search for justice through truth trust and transparency are abandoned as is the culture of the Australian Legal System because it fails to respect the family unit and those who are members of that unit! We must all stand together against this legal tyranny and demand a judicial structure that is not based upon the principals of war but are based upon the principals of seeking the truth through transparency so as to restore our trust in what has now become a very corrupt process that predetermines the outcome based upon who has the money. hear, hear! I wish it were so…no one wants to be on the receiving end. They are lawless. Our HONOURABLE politicians are too busy calling each other PARASITES. This also raises great concerns because if I tried that in a work environment, I would find myself being given a formal warning though. The double standards is ever so growing and the decision makers are so well protected and entrenched in this culture of corruption to influence change.The fact that Shareholders money is being used to protect EXECUTIVES, DIRECTORS is an absolute disgrace, but happens daily. Are you allowed to tell us what happened on the 8th and the 10th? They put another suppression order on the 8th but not the 10th. I need to file a new defamation defence and as I said in the post they have instituted contempt proceedings. I’m no lawyer, but I did see that you have had issues previously with the Judge that ordered the suppression order about the “2 out of 4” women. If what you say is true what is the process of involving the ICAC to investigate? 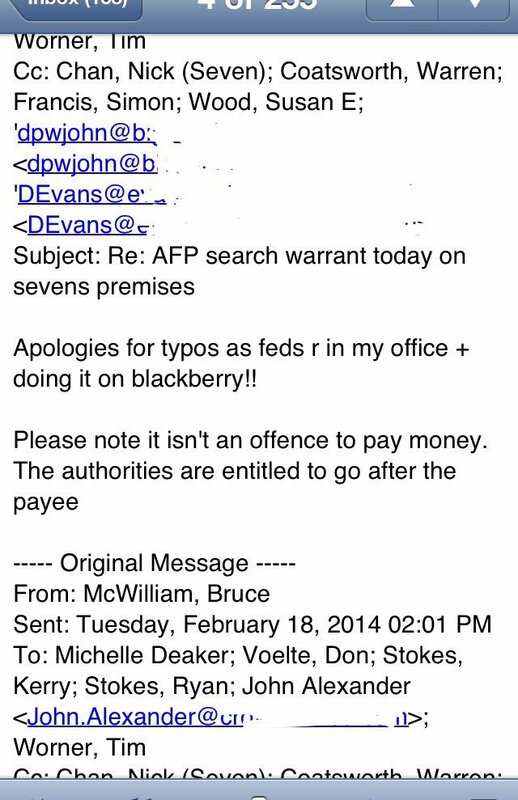 Don’t get me wrong – Lawyers investigating Lawyers – doesn’t bode well for a suitable outcome…. but none the less…. To whom do innocent people turn to when criminal actions against them are ‘sworn’ to be false and falsified documents are presented by the criminals, and a corrupt judiciary believes the documents to be truthful, especially if the documents are from a ‘legal’ source. Stokes & Co must be well read on the subject of Judicial Immunity which is a form of legal immunity which protects judges and others employed by the judiciary from liability resulting from their judicial actions. A judge is not liable for a slander or libel suit for statements made about someone during a trial, no matter how corrupt that act was. Judicial immunity is stated as providing ‘the maximum ability of judges to deal fearlessly and impartially with the public’. Stokes & Co being convicted in a court of law under false claims, the ‘burden’ of being subjected to a court of law (a trial) would 'dampen' the judges ‘enthusiasm’ or ‘passion’. Opponents of judicial immunity argue that this doctrine is not adequately justified. publically issued licence, so a royal commission could be called on the morals and ethics of those holding licence. Just some thoughts….the getting in bed with ex pollies certainly has the look of corruption and public review and oversight required. 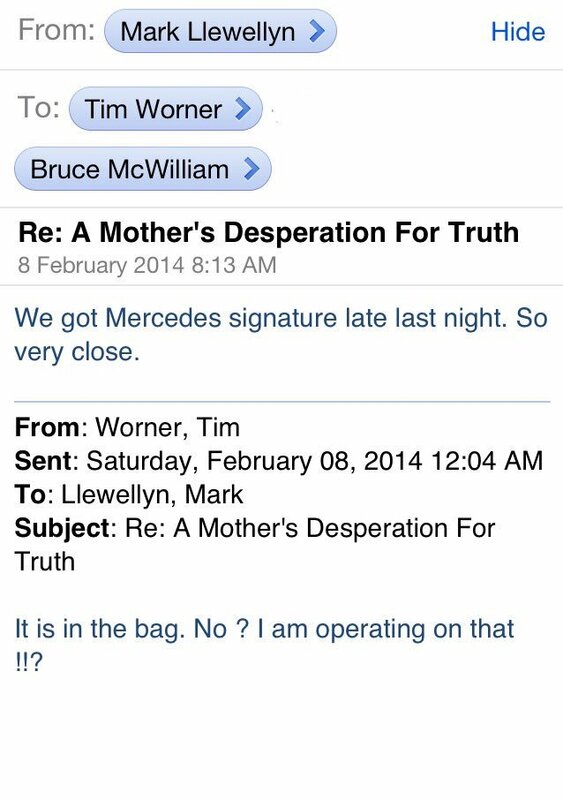 From a pure financial aspect, will the the shareholders ever ask/or receive at the Annual General meeting, for the company to give them a full account of all the legal costs that are accountable to these actions against all these ex employees not to mention Worner’s legal bills ?. additionally, no doubt shareholders would be very keen to know the Board makes appropriate checks to ensure their business is well managed and is in capable hands, free of outside influences ! Amber you are one brave lady but sadly where are our Australian feminist supporters? WHERE ARE YOU…Anne Summers, Tanya Plibersek, Penny Wong or Julia Gillard.??? Love to hear from any of you!! Their all in bed with the media owners and boards…. A ABC ‘Q and A’ program (with Amber subject to being within the law) on this would be a hoot. I might even watch ‘our’ fake ‘leftie’ ABC for a change and hear our feminists go for it. Mr Worner will have to lead the presentation of the company’s results on Wednesday and will presumably be asked about the scandal by journalists, although it is unclear if analysts or investors believe the ongoing publicity will have any impact on profits. Yesterday, Justice McDougall ordered Ms Harrison not to disclose any confidential information belonging to Seven, including “text messages, email communications, photographs and all other forms of electronic and physical documents”. Unusually, he also barred her from “either directly or indirectly, giving any interviews to any medium or media, or from making, authorising or procuring any public statement, publication, off the record comment, background information, publications, press releases, press conferences, or from participating in social media” about matters including Seven, her departure from the company and her relationship with Mr Worner. The lawyer for Seven West boss Tim Worner’s former lover Amber Harrison, has vowed to fight an extraordinary injunction gagging her from speaking about her relationship with the TV boss and her dispute with the media giant. He said an order gagging Ms Harrison, made in her absence yesterday by NSW Supreme Court judge Robert McDougall, was “an extraordinary injunction, an ex parte injunction — it should be reserved for extraordinary occasions”. How does one obtain a copy of the court orders handed down to AH? I cannot locate anything on AUSTLII? Is it possible?? What on earth has Amber Harrison done with the $330,000 she has already received from SWM? Good grief! A bit of doubt is creeping in. You cannot put a price on corruption and coverups. Until you experience the journey, it is not pleasant. Ask yourself how much has been spent on legal fees? Is that fair? Unless presented with all of the facts, I think its way too early before you start judging.. SWM are GAGGING everyone that attempts to get to the truth..
short end of the stick, and this ALLENS report is not worth more than the paper that its written on ! !